It’s been a while since we last saw our favourite deerstalker wearing sociopath sleuth in action; More exactly; the beginning of 2014. 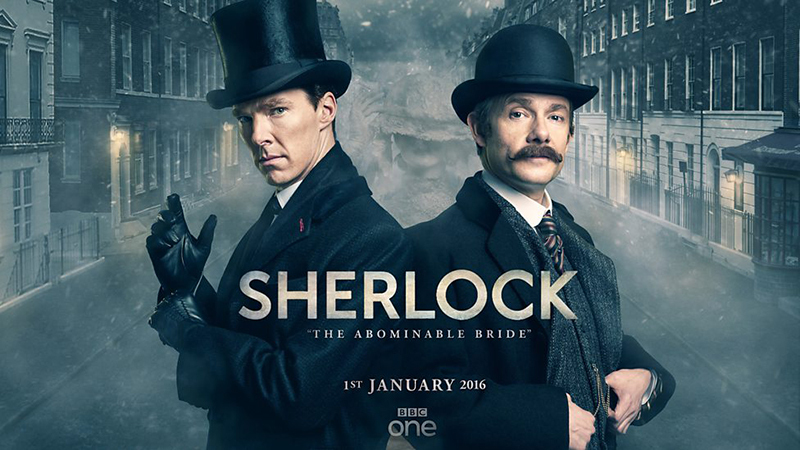 It’s now 2016 and with it comes a one off special in the form of The Abominable Bride. Set in the 19th Century, the time of Arthur Conan Doyle’s original novels, it’s a novel concept that works, just about. When we say ‘just about’, of course, that’s exactly the point. This is a deceiving episode in that it begins as a standard period narrative but soon reveals itself to be all in, as it where, the Mind Palace. It’s a clever concept that will please many fans of the modern narrative but really throw those expecting an old style detective story right off. Of course, we kind of guessed this wouldn’t be any ordinary adventure and if it had been, there would have been an equal number of voices expressing a disappointment at the departure from the quirky narrative structures that Messrs Moffatt and Gatiss are known and infamous for. But overall, what did we make of The Abominable Bride? Of course, it was gloriously improbable and mad and that’s just what it should be. Sherlock, the show and the character, has never been anything less than unexpected and innovative though so it’s only right that this special was one of the most surreal episodes yet. The 1880’s versions of the cast were often amusing, although rarely played for laughs. Perhaps the most chuckle inducing of them was Mycroft Homes, a rather bulked up Mark Gatiss. The sight of him sat in the Stranger’s Room surrounded by what by anyone’s standard is a very large morning meal is quite at odds with the secretive, rakish character we’re used to seeing. Indeed, the hilarious moment Holmes and Watson enquire via various degrees of sign language at the reception of The Diogenes Club as to his presence is hilarious. Other iterations of characters include a successfully dragged-up Molly Hooper in the rather atmospheric morgue. But with the exception of the former, the cast are quite close to their already known characterisation. Mrs Hudson is still as funny as ever, casting humourous references to the role of female characters in the original stories from almost her first line. She’s still, however, the Landlady and, quote Holmes, ‘has the power to starve’ them! Holmes of 1880’s though is rather more of the age, often boorish and rarely complementary of anyone or thing without a catch. Saying that, from the modern perspective, he’s also absolutely hilarious on occasion. The scene when he and Watson stake out the mansion waiting for The Bride to arrive is a case in point. As Watson attempts to make conversation as old friends do, his reactions are right on character with the cold hearted period version. As if he hasn’t returned enough already, a certain Moriarty also makes an appearance and confirms just what more eagle eyed viewers may have noted all along. That is, this whole sequence is a Mind Palace moment. As Sherlock himself states at the end of the episode, there is no way he could still be alive but it appears he lives on as a ‘virus’ in Sherlock’s ‘hard drive’, explaining a few non chronological moments scattered throughout the episode. But once the credits have rolled, what is the viewer left with? Now, we watched this twice to get a proper handle on it, but on first watch it will have either bowled you over in awe or totally gone over your head. As a seasonal indulgence, (as this would never work in a regular series), it was forgivable though. After all, who else is producing television as exciting as this at the moment? Not too many, it has to be said. If you’re a Sherlock purist though, it’s probably not your seven percent solution. Whatever your opinion though, it’s a sad New Year without Sherlock and this will keep viewers guessing until series four comes in 2017. But as thought provoking, brave drama goes this is certainly up there with the best. Best moments: Spotting the regular cast in their Victorian guise was fun, with Mycroft Holmes and Molly Hooper’s iterations the most effective for our tastes. The sign language scene at The Diogenes Club is one to remember for sure. Casual sexism: Throwing the frequent accusations of sexist typecasting often aimed at him, Stephen Moffat throws all the wood on the fire he can here to hilarious effect. Of course, Sherlock is not a show that revels in misogyny and the final moments here were certainly an answer to those who have questioned such aspects of his writing as a whole. What next: Bring on series four. There is no percentage of solution strong enough to compensate for the wait until the new series!